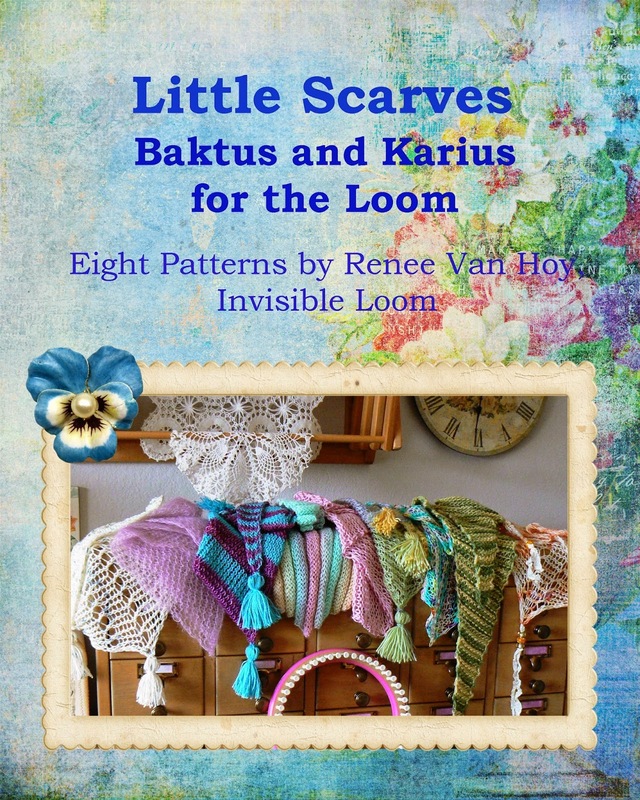 I am happy to share with you my new e-book pattern collection, "Little Scarves: Baktus and Karius for the Loom". Be sure to read to the bottom of the post about some special promotions and drawings. The simple triangle scarves known as Baktus and Karius are based on the premise that the size of the scarf is determined by the amount of yarn that you have. This e-book contains eight patterns, each written for three loom gauges: 5/8 inch, 1/2 inch and 3/8 inch. Sizing and yarn are also included for all yarn weights, as well as instructions for variable sizing. Your Baktus and Karius are limited only to your imagination. Below are some preview photos of the patterns. The Little Scarves e-book comes with two pdf files. One is a 66 page large print 24 point font text, with a cover and photo gallery. The other is a 32 page paper-saver version in 12 point font. Both files work with screen readers and the pdf read out loud function. Both files are tablet friendly. You may read and print your patterns just the way you prefer them. To celebrate the publication of this new e-book, all purchases of the e-book made through September 30, 2014 will include a $2.00 off coupon, good toward any pattern purchase of $6.00 and up from Invisible Loom during the month of September. All purchases of $6.00 and up through September 30, 2014 will also be entered in prize drawings . Everyone who has purchased or purchases the Geranium Petal Shawl pattern will receive $2.00 off the Little Scarves e-book. Copyright 2014 by Renee Van Hoy, Invisible Loom. All rights to text and photographic material reserved. Do not copy or distribute in any form.